The Apple AirPods Wireless Bluetooth Earphones are on sale at a discounted price of Rs 12,442, along with a cashback of Rs 1,493. Today we have deals covering a wide category of devices. We have listed some of the best deals you can get on gaming consoles, audio devices like headphones and earphones, and more. The Philips Bluetooth soundbar has a power output of 40W and comes with an external subwoofer which has a max power output of 18W. The device has 2.1 configurations with an aux input connection. You can buy it here. The Samsung monitor sports a full HD resolution and flicker-free technology. It features a LED-backlit panel and has a response time of 5ms. You can buy it here. The Samsung Galaxy Note 8 is powered by the Exynos 8895 octa-core processor with 6GB RAM and 64GB internal storage. It features a 6.3-inch QHD+ display and features a 12MP dual-rear camera and an 8MP front-facing sensor. You will also receive an Rs 8,000 cashback as Amazon Pay balance on purchasing it via the seller STPL. You can purchase the smartphone here. The JBL headphones come with 32mm drivers and sport a frequency response between 20Hz and 20KHz. It comes with a mic and button to control music playback and flat wires which don’t tangle easily. You can buy the device here. The Bluetooth enabled Apple AirPods boast of giving three hours of audio playback in a short 15 minute charging time. It comes with a case, which also charges the devices. You can buy it here. 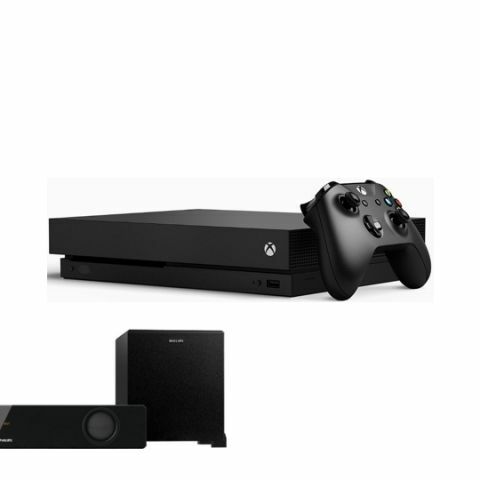 The recently launched Xbox One X is on sale with a 10 percent discount and the console supports gaming at 4K resolution and also doubles as a Blu-ray player. You can check it out here. The PS4 features High Dynamic Range (HDR) technology and features 2.4GHz/5GHz Wi-Fi mode options and HDMI 2.0 output. The large 1TB HDD should be sufficient for most gamers and it comes pre-bundled with the COD Infinite Warfare title. You can buy the gaming console here.